NHS services are insufficient on their own to discourage people from smoking, a study says. The British Medical Journal research instead calls for stricter measures, including a complete smoking ban and targets to narrow inequality gaps. Using Northumberland and Tyne and Wear data, the study said NHS services on their own were not enough to meet national smoking reduction targets. But the government said it was using other measures to help people quit. 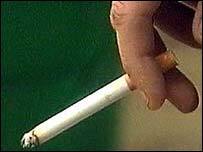 Ministers have set a target of reducing smoking prevalence from 26% to 21% by 2010. The study predicted the NHS smoking services would contribute less than 1% towards this as they had only helped to cut smoking by 0.1% to 0.3% in 2003-4 in the area surveyed. There are 170 individual stop smoking services across the country offering one-on-one counselling and group therapy. The clinics also offer nicotine replacement therapy to try to help people give up. Report author Dr Eugene Milne, deputy medical director at Northumberland Tyne and Wear Strategic Health Authority, said smoking cessation clinics were "not enough on their own". He favours individual cities, such as Liverpool, introducing complete smoking bans. The government proposed a smoking ban in its Public Health White Paper last year but exempted pubs which do not serve food. Dr Milne also said he was disappointed the national target failed to encourage a narrowing of the gap between poor and rich areas. In the north east, a third of men and a quarter of women smoke - above the national average. "Against this background, it is disturbing that the smoking prevalence targets do not propose a narrowing of the inequalities gap," he said. Jean King, director of tobacco control at Cancer Research UK, said smoking cessation clinics were a "step in the right direction" but not all people wanted to use such services. Amanda Sandford, research manager at anti-smoking campaign group Ash, said: "We need a comprehensive ban on smoking in all workplaces and not the half-hearted policy that is currently being proposed." Shadow Health Secretary Andrew Lansley said: "The ineffectiveness of current smoking cessation services is a serious concern for the nation's public health and means poor value for taxpayer's money." A Department of Health spokeswoman said there were one million fewer smokers than six years ago and the government was on track to meet the 2010 target. She added measures had or were going to be introduced to limit smoking by other means, including a smoking ban, restrictions on advertising and health warnings on cigarette packs. And on health inequalities, she said more money was being given to primary care trusts, which are currently drawing up plans to improve public health in the most disadvantaged areas.